Dr. Scott Parker and his team offer high quality dental care for Calimesa, CA and all surrounding areas. We are happy to be the trusted dentist serving Yucaipa, CA, patients too. Our dental patients from Yucaipa know it’s worth the short drive to visit a dentistry team that offers comprehensive care in a relaxing and modern environment. Our dental office is conveniently located right off the freeway, and we can’t wait to meet you! Learn more about our superior dental care, then schedule an appointment for you or a loved one at Scott Parker DDS today. When patients ask us why our Calimesa dental office is worth the short drive from Yucaipa, we have a simple answer – we care. Too many dental practices in the area seem to care more about their bottom line than they do about their patients. At the Calimesa dental office of Scott Parker, DDS, we go the extra mile to deliver quality dentistry services in a welcoming and stress free environment. Another reason so many patients from Yucaipa visit us is our convenient location right off of the highway for easy access. You can follow the directions below to reach our office, but don’t hesitate to give our team a call to learn more or get help finding us. I started coming years ago after cracking a tooth. "Painless Parker" was an accurate description. Now my family of seven goes to Dr. Parker and always receive excellent care. I appreciate how they do their best to schedule appointments around my work schedule. We have found a new dentist and are so very relieved. 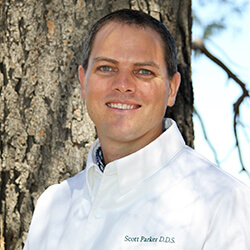 Scott is a fantastic dentist with a tremendous staff that is very responsive to all of our needs. His gentle care can put the most nervous person at ease. Awesome place. When was the last time you and your loved ones had a dentist you actually looked forward to visiting? It’s possible -- just ask our patients why they make the drive to see Scott Parker DDS and the team in Calimesa, CA. We offer all the services you expect from a general dentist, plus a few more. Give us a try! Contact us to schedule an appointment today.